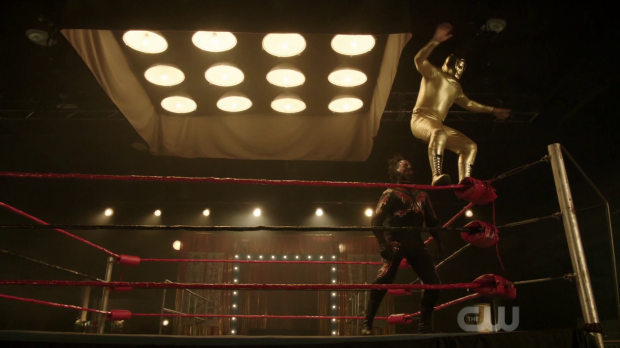 DC’s Legends of Tomorrow returns from a long hiatus with an unconventional love story and a visit to 1961 Mexico City to take in the wrestling culture. Mona has been a great addition to the cast. In many ways she embodies the values that we should all aspire to as she takes the time to appreciate people and creatures for what they truly are rather than what they are assumed to be. This is what makes the romantic plot she shares with Konane (Darien Martin) the Kaupe so endearing. Despite his monstrous exterior and the barrier to communication that exists because of his limited language skills Mona is able to understand him and earn his trust by showing that she respects him. Everyone else sees him as a savage but she sees him as a noble king taken away from his kingdom. Their relationship forms the basis of this episode and either directly or indirectly touches on the other plot threads that it covers. The Time Bureau are being set up as an untrustworthy organisation because of what Hank intends to use them for which informs Mona’s escape from hospital at the beginning of the episode as she has become aware of a conspiracy that looks to be a significant plot point over the rest of the season. She sends Konane into history and he winds up in Mexico City in 1961 where he becomes a very successful Mexican Wrestler adored by all who witness his exploits. It’s an ideal situation for him as he gets to satisfy his violent urges while being worshipped and adored in a way that befits a king. Naturally his presence has consequences for a fictional historical celebrity by the name of El Cura (Frank Gallegos). Konane’s fame has robbed him of his rightful place in history as a celebrated wrestler and star of film/TV. This may not seem like a big deal in comparison to the stakes that have driven other episodes but it acts as an example of a typical Legends mission and adds diversity in the storytelling by having a mission where the fate of the entire timeline isn’t at stake. As always the intervention of the Legends ends up creating a larger problem that they have to solve. Removing Konane without any explanation for his sudden disappearance sparks riots over governmental censorship resulting in many deaths. Naturally this can’t be allowed to happen so a plan is hatched to have one final bout that allows Konane to retire gracefully while El Cura reclaims his former glory by winning over the crowd. Of course it doesn’t go entirely to plan but the end result is more or less the desired one so that can be considered a win. Running underneath this is the Mona/Konane relationship. Mona is constantly on his side and wants to make sure that he’s safe. She brings out a tenderness in him that resembles the Beauty and the Beast dynamic that will be familiar to most. It’s not all that original but it doesn’t need to be and Ramona Young carries this plot wonderfully despite her co-star mostly expressing himself through a series of grunts. Concluding this with Konane’s murder and Mona’s dramatic transformation into a werewolf is an appropriately tragic and shocking moment. This likely grants Mona a special skill that makes her the perfect sort of misfit for the Legends while also tying into the season’s main theme of things not being as they seem. The romance/Mexican wrestling plot feeds into other threads that are ongoing such as Hank’s shifty behaviour indicating corruption at the Time Bureau. Mona is basically a fugitive because she knows too much and is used as a scapegoat for Konane’s escape even though he was hauled off by men in black who have mysteriously vanished from all footage. At this point his master plan is unclear but he wants to keep it completely secret from anyone at the Time Bureau including Nate and Ava. This inspires some baffling behaviour from Ava who spends the episode blindly adhering to protocol rather than actually thinking about the situation. She sees the Legends as being a hindrance to her own mission and ignores Sara’s judgement of the situation despite repeated insistence that she should trust her. This is such badly manufactured conflict to create tension within the episodes and ignores everything about Ava as a character. The attempted justification of Ava’s actions as needing Sara to do what is asked of her just this once doesn’t work nor does her willfully ignoring the corruption because Hank is responsible for a great deal of funding being thrown their way. On one hand the idea of money being a barrier to helping people and having to adhere to governmental oversight is a good idea but there are really easy ways to use time travel to secure funds. It also compromises Ava’s integrity as she puts up with something that flies in the face of what she stands for. Put simply, Ava is supposed to be better than that. Having her break up with Sara is also needless melodrama do in summation this is far below this show’s usual standards. I’ve repeatedly mentioned that I’m not all that invested in Nate’s strained relationship with his father but this episode goes a long way towards making it far more interesting. The tension between them makes Nate receptive to the idea that Hank is up to no good and willing to investigate this. Once he learns the truth he’s willing to accept it and looks to confront Hank immediately but decides in the moment that he’s better off biding his time. Instead he tries to become part of Hank’s trust circle so that he can be better placed to do something about whatever his plan happens to be. It doesn’t work yet but it seems that Hank will confide in him soon enough so I suspect the real danger will be Nate seeing merit in what Hank is planning. 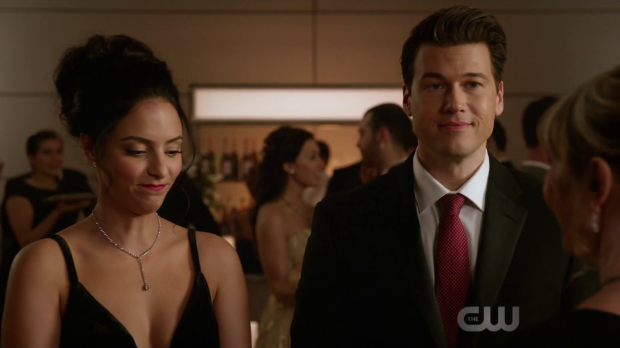 This episode also teases a potential romance between Zari and Nate that may not go anywhere but the fact that the episode makes a point of suggesting that there might be something more to their team-up than a convenient way to work an angle that benefits the overall mission. I’m never a fan of pairing characters up for no real reason and these characters don’t make much sense as a couple based on their limited interactions and the little they seem to have in common. There are better ways to use both characters so hopefully this won’t amount to anything. A mixed bag of a return for the show that showcases an endearing unconventional romance but forgets established character traits to manufacture drama. Mona is a great addition to the show who embodies the values that we should all aspire to in terms of her clear acceptance of all creatures. Her romantic plot with Konane comes across really well despite its familiar Beauty and the Beast dynamic. It’s really endearing to watch and Ramona Young carries it well despite her co-star expressing himself mostly through grunts. Their relationship forms the basis for the episode and has the other plot threads feed into it in different ways. Konane becoming a Mexican Wrestler in 1961 is fairly miniscule as far as stakes go, at least at first, but it comes across as a fairly standard mission for the Legends that badly escalates because of their involvement. Hank’s shifty behaviour and involvement in the corruption of the Time Bureau isn’t all that interesting on its own but adds intrigue to his strained relationship with Nate who is willing to accept that his father is up to no good. He decides to play the long game and try to enter his trust circle in order to find out more information. The danger may come from Nate seeing merit to Hank’s plan. Less effective is the implied romantic tension between Zari and Nate. Hopefully this won’t go anywhere as these characters make little sense as a couple and there are better ways to use both of them. Ava blindly adhering to protocol and seeing the Legends as a barrier to be overcome makes little sense when considering her as a character. She ignores Sara asking for her trust because her actions are counter to her orders. Trying to justify this by having her ignore the corruption because otherwise they may lose funding that only exists because of Hank doesn’t work as it compromises her integrity and feels badly out of character for her. Ava breaking up with Sara over this also counts as unnecessary melodrama.